Digital Subscriptions > Build It > Aug 2017 > IS CONTEMPORARY DESIGN right for me? What I love about self-build is that the design of your home – within reason – reflects your personal style. As an architect, I believe the structures we develop – today’s contemporary architecture – should reflect the best of our creative abilities. That way, future generations will be able to look back and be proud of what we achieved. So what do we class as contemporary design? More importantly, will our successors like it in the future, and will these buildings stand the test of time? 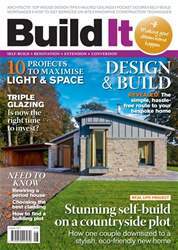 Exposure to great architecture via television and magazines like Build It has raised the bar in terms of what we expect from individual homes. But currently, there’s a lack of innovation in volume house building, so I expect that the developer aesthetic won’t be treated with much respect in the future. As a self-builder, you should always strive to create a property that says something unique about you – it’s your chance to seize the opportunity and truly make a mark. There are design trends common to many of the new builds that architects are working on at the moment. I’ll explore some of these aesthetic features in this article and explain how to incorporate them successfully, so you’re left with a dwelling that fulfills your aspirations.